Dr Megan Clark is Chief Executive of CSIRO, Australia’s national research agency and one of the leading mission-directed, multi-disciplinary applied research organisations in the world. CSIRO aims to deliver profound impact for industry, the community and for a sustainable future from its science and is well known for developing the wireless LAN now in over 4 billion devices world-wide. Dr Clark is currently Chair of the Mining for Development Advisory Board for AusAid and a principal in the Global Research Alliance which brings together nine global applied research peers to support inclusive innovation for the world’s most disadvantaged. 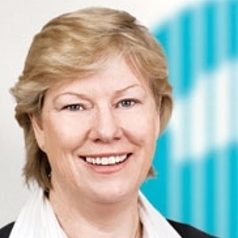 She is on the Prime Minister’s Science, Industry and Engineering Council, Minister Combet’s Manufacturing Leaders’ Group, Member of National Precincts Board, Member of Council on Strategy and Innovation and is a member of the Advisory Board of the Bank of Merrill Lynch in Australia. Megan is a geochemist with a BSc (Hons) and PhD from Queen’s University Canada and began her career as a mine and exploration geologist.